We first made friends with ECD, East Coast Devastation, when Highwayman was in town for work and got in touch with Fly Swatta to join a practice. Our teams connected for scrimmages and bench coaching/bout help a few more times before we finally scheduled reciprocal bouts. ECD came to us for our first ever Co-Ed home game on August 27th and took on an entirely new ruleset, our traditional WFTDA. In preparation for our bout at their place, November 12th, we worked extra hard at learning their OSDA ruleset – which although 33 pages shorter than ours, was somehow more confusing! When the day came for us to leave however, ECD actually stood for “Everything that Could go wrong, Did.” DangerAzz was suffering from a major toothache that landed him and Pizazz in the emergency room. Krash Klown was still recovering from a 3rd degree burn on her hand. Hell-ga and Nini had been sick for days, a borrowed RDD skater (KlusterFlux) had a death in the family, and to top it all off, Vamp Stamp’s car got hit in the parking lot! 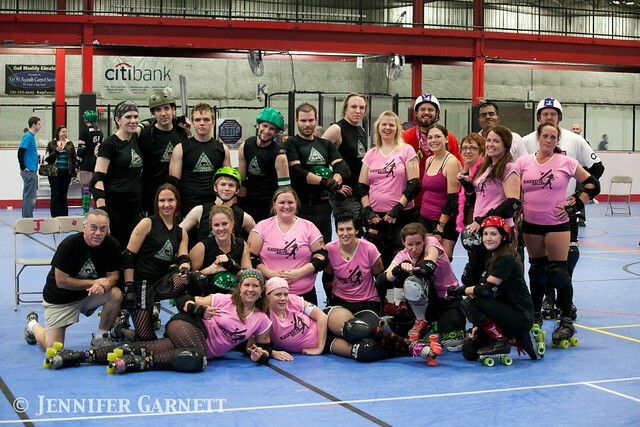 Despite all these obstacles, we came, we saw (a scrimmage with NoVa and DC teams prior to ours), we skated. For a further bad omen, just before the half time, the score was 66 – 6 (their favor). But, with extra help from Groper Cleavage and special guests Feeler Up (from BlackRose Rollers), last minute addition Maiden China from Chesapeake Roller Derby, and NoVa’s Debbie Does Dulles, we held our own in the second half, scoring the majority of our points and minimizing the opposition’s (hey, we kept them under 100!) Final score was 96 – 26, and Hell-ga was nominated as our MVP. Blackwater is very appreciative of our bench staff (Ron the General and Parrabellum), NSO Meryl Shriek, and guest skaters Fro Down from Star City and Stevel Knievel from Richmond Derby Demons, for their help with this challenging bout! Most of us were able to attend the afterparty at Buffalo Wing Factory in Sterling, and we finally made it home….just in time for FreshMeat Recruitment Night November 15th! The fun never stops! We know what the score said, but who won these mini competitions? Furthest travelling player : ECD’s Evil Petting Zoo (from Raleigh, NC) vs. BWR’s Fly Swatta (from Atlanta, GA) Winner = Fly! Long lost reunion: BWR’s Ron the General with his daughter Rebecca vs. BWR’s Beccanator with derby name twin Bacon Ate Her from Hawaii Winner = Ron the General! It was a great end to our season! Thank you ECD!